Mine: Great adaptation. Wonderful portrayl of the town. I want to live there. Very re-watchable. Hannah is actually not bad. 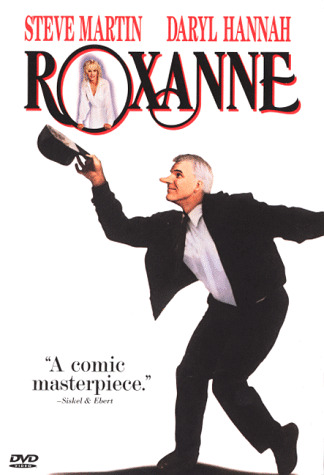 Leonard Maltin/Plot synopsis: Martin fashioned this update of Cyrano de Bergerac as a vehicle for himself, with Hannah as the object of his affection and Rossovich as the empty-headed hunk for whom he ``fronts. '' Extremely likable and sweet-natured romantic comedy set in a sleepy ski town. Peters out somewhere along the line, unfortunately. Panavision. (out of 5 stars) Michael J. Pollard (who played Fireman "Andy" in "Roxanne") being one of my "quirky" favorite supporting actors, I was amazed to find no bio on him on the site AT ALL! He was brilliant in "Bonnie & Clyde" as C. W. Moss and, in the mid-60's did a lot of TV roles. Notable among them, an episode of "Lost in Space", wherein Michael J. played "boy", the sole resident of the Dimension to which all "lost items" go... Certainly a photo from one of the many "Bonnie & Clyde" posters could be "cut and pasted" to show Michael J. alone!? (out of 5 stars) This is one of the best Steve Martin films out there. Martin did the screenplay for this film and I was impressed. This is unlike any other movie I have ever seen. It has a fresh appeal that I've not seen in a long time. It's got a soft undertone and it doesn't tire the audience. It's funny in a subtle way, amusing. The scene where Martin is in the bar with the heckler and does the "20 something betters" showcases Martin's stand-up talents. The romance with Daryl Hannah's character and Martin is touching and well acted. The opening scene with the physical fight between the tennis players and Martin is a little over the top for me, but has it's moments. Overall this movie never gets tiring and just writing about this movie was reason enough for me to get it out and watch it while writing this "review".